It’s no secret that the internet is constantly improving. A connection that gave your business cutting-edge advantages 10 years ago would be a serious hindrance today. We’ve gone from the 56 Kbps crawl of dial-up, to early 1 Mbps broadband, to faster 50 Mbps copper connections, all the way to our modern 1 Gbps fiber-optic connections. Movies that once took days to download now require mere seconds through modern fiber-optics. The obvious question is, how far can we push it? Internet speeds have multiplied 100-fold every 10 years, and it isn’t slowing down. There have been laboratory tests of cables ranging anywhere from 10’s of terabits, to 1-2 petabits per second (1000 terabits). These new hyper-speeds are all thanks to certain characteristics of fiber-optics, but to understand that, first you have to look at how fiber works. How Do We Get Internet Through Fiber Glass? 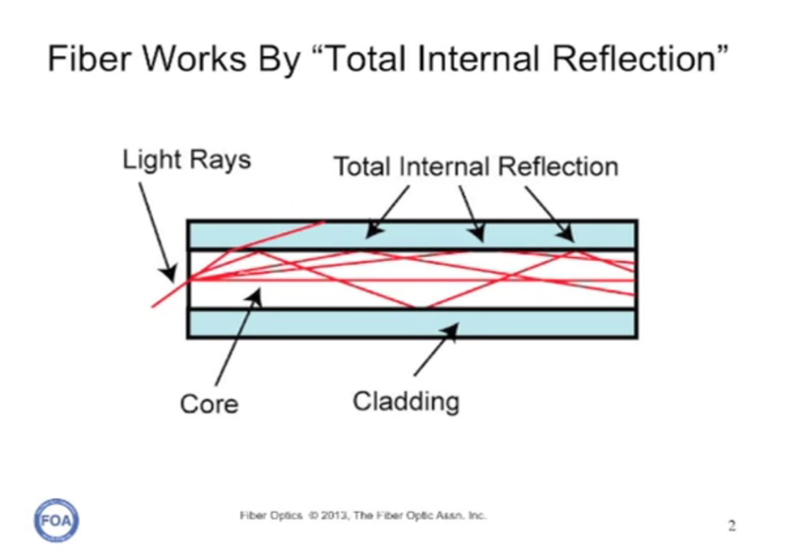 Fiber-optics work by sending data as pulses of light through a glass fiber. Simple enough. But how does this process actually work? At one end of a fiber-optic cable, a laser or LED transmits data as light. At the other end of the cable, there are light-sensitive receptors that interpret that light as data. Think that’s impressive? Wait until you hear what happens inside the cable itself. It works like this: as long as light hits glass at a shallow enough angle, the light will reflect off without losing any energy. Because of this, light can go from one end of the core to the other without ever changing its wavelength. There are two broad categories of fiber cores that determine how light can travel through the cable. The category that includes most of the cables throughout the world, including the ones running across the ocean floor, is called single mode. In single mode, there is only one pathway, or “mode,” that light can travel along. Multimode cores are the other category, and they look more like a circus funhouse, with beams of light traveling along a variety of pathways though the core. In theory, increasing the number of modes light can travel along should increase the amount of data you can send at once, but there are practical constraints to multi-mode transfer that limit how far you can send data reliably. If you have one light beam traveling in a straight line down the core, and another bouncing around at a steeper angle, the straight line beam will reach its destination first. Over a short distance (like within a building) this isn’t a big deal, but across larger distances the time difference is exacerbated. This difference, which is called “modal dispersion,” will distort the data the cable is transferring. Because most businesses need to send data farther than the second floor, the vast majority of cables are single-mode. We’re not running out of bandwidth quite yet (thousands of miles of already-laid fiber-optic cables are unused, what is referred to as “dark fiber”), but with the internet’s history of rapid growth, it’s always best to plan ahead. And because we’ve already covered a great deal of the world in single mode fiber-optic cables, our best option seems to be optimizing them. One way this is being done is with wavelength division multiplexing. Try saying that 10 times fast. We differentiate color based on the wavelength of light. Light-sensitive receptors in fiber-optic cables break down light similarly, differentiating between different wavelength bands. Because of that, even if there is only one available mode in a core, different wavelengths can be “bundled” together in the same mode. New technology called the “flexible grid” has found a way to bundle different wavelengths even more efficiently, leading to transmission rates of 1.4 Tbps using existing single mode cables. At this speed, you would be able to download 44 HD films in a second. Recently, a new record was set for fiber capacity, clocking in at 2.15 Pbps. This achievement combined two technologies: multicore single mode cables and spatial dimension multiplexing (SDM). Multicore cables are just what their name suggests — cables that fit multiple cores into a single cladding to allow for more total data transfer without the distance issues of multimode. Recently, an 8-core cable transmitted at 9.6 Tbps. SDM is a little more complicated. We’ve talked beaming light at different angles, but not in different shapes. This is where SDM comes into play. In this particular case, we’re talking about optical vortices. Using orbital angular momentum (think Earth’s revolutions around the sun), a light beam can be “bent” into a helix, spiraling around the core. 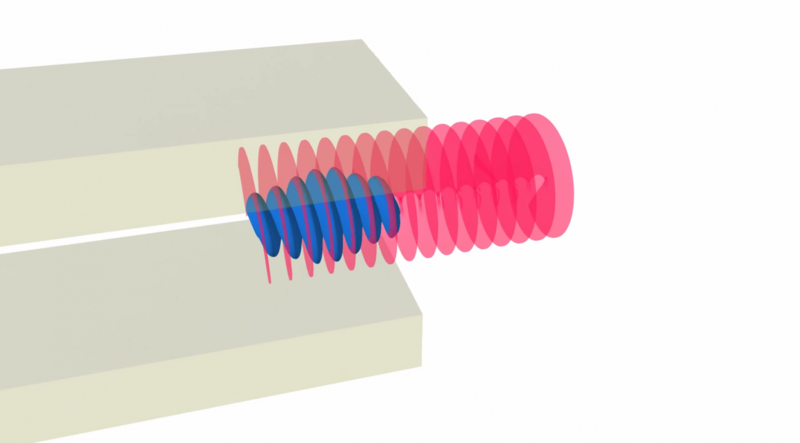 This allows scientists to fit more beams into a cable, meaning more data can be transmitted. 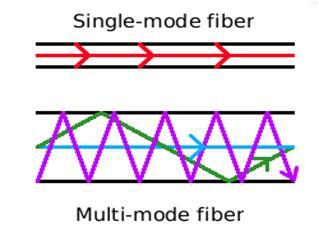 Because traditional single-mode fibers aren’t capable of SDM, it requires the use of a multicore cable. In the case of the world record group, this cable had 22 cores. By combining this cable with the bundling of wavelength division multiplexing and SDM, researchers destroyed the world record. For context, at 2.15 Pbps you could download the entire written works of mankind, in all language, in about three minutes. So When Are We Getting Our Blistering Fast Internet? It might be a little while before we see any of these petabit download speeds. Such speeds would require us to replace all the fiber that’s already been laid, which would be insanely expensive. However, current commercial fiber can still easily hit gigabit speed, and with advances to existing fiber cables, like the “flexible grid,” we can expect increases in the range of 100’s of gigabits per second, perhaps even breaking into the terabit range, in the not so distant future. These advances aren’t commercially available yet, which means for now you’ll have to get by downloading movies in seconds instead of milliseconds, but don’t worry. This future is always closer than you think.